With the ever-increasing need to be connected at all times, there has been a virtual explosion of devices on the market that will provide you with WiFi or mobile hotspot access. Not all of them are good, some of them are spectacular, and others are merely serviceable. What they all have in common, however, is their size. And the fact that you usually have to jump through any number of hoops in order to get them to work. 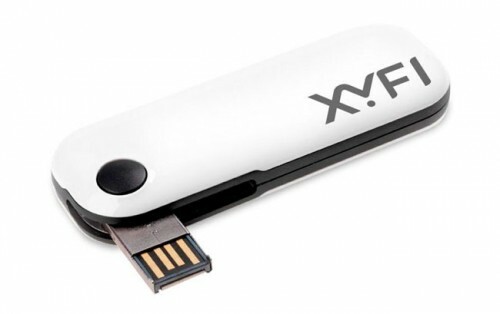 Enter the Option XYFI WiFi Mobile Hotspot. This is being billed as the world’s smallest 3G+ WiFi mobile hotspot, and I have no reason to disbelieve the claim as it appears to be about the same size as the average flash drive. All it requires to work is an open USB port, and it requires no software or drivers to operate. At first blush, it just looks like a USB modem, but it is actually a mobile hotspot that will support up to eight separate devices with either WiFi or 3G. It doesn’t have an internal battery, but rather plugs into a 4000mAh xpal adapter for up to eight hours of battery life. Also available is a car adapter and an AC adapter. It even has a microSD slot so you can share files over your own local network. Pricing and availability have not yet been released, but this was unveiled at MWC and information should be forthcoming within the next few weeks.